Edinburgh Manor, commonly referred to as “The Manor” served as a poor farm, a mental institution, and an elderly retirement home. Throughout its decades in operation, The Manor has played host to many dark occurrences, and it has earned a reputation as one of the most haunted buildings in the whole of the United States. As an impressively large building hidden in the middle of 11 acres of corn fields, filled with decades of dark history – when you look at Edinburgh Manor’s imposing facade, it looks right back. To understand why Edinburgh Manor is so infamously haunted, we first must look at its history. The town of Edinburgh was the original county seat of Jones County. In June 1840, nearby land (section 36 in Wayne Township) was deeded for courthouse purposes through a grant signed by President Buchanan, the 15th President of the United States who served just prior to the American Civil War. Shortly after acquiring the land, the county government moved its seat about 10 miles west to Anamosa but kept the land grant for the establishment of a county poor farm. Historically, a poor farm (or poorhouse) was a local government-run facility used to support and house the poor and the needy. Most poor farms were working farms and residents were expected to provide labor in the fields, in the house, and in resident care as the price for room and board. In reality, the house held those who were thought incurably insane, those with disabilities of various severities, and the elderly abandoned by indifferent family members. The reliance on poor farms to aid the needy declined after the Social Security Act became law in 1935, and most poor farms were no longer by the 1950s. The original poor farm located at the current site of Edinburgh Manor was host to many residents or “inmates”. Some passed through and were discharged, others died on the farm. The dead were released to family members or buried in a pauper cemetery located on the property, but undocumented rumors suggest that some of the dead were not buried in the cemetery but rather at various locations around the farm. The number of inmates varied from year to year, as documented in reports published by the committee on poor farms. One such report from 1874 stated that the 11 inmates residing there at the time were: “insane 1, nearly blind 1, fit (seizure) 1; rest of the balance old and decrepit.” Over 80 people are thought to have died on the farm. The original farm building was in used until 1910 when it was demolished and replaced with a new structure that opened in 1911, the current Edinburgh Manor. 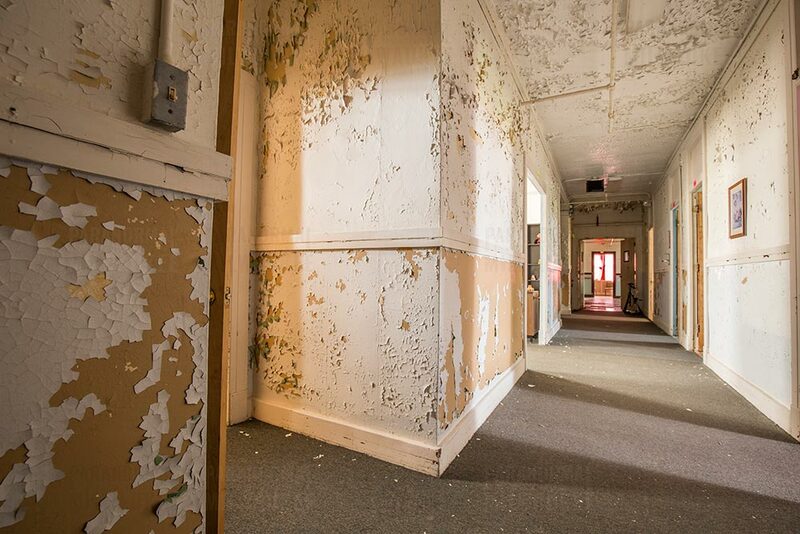 The structure is an impressive 12,000-square-foot building consisting of two floors and a basement and served the elderly, the disabled, and the mentally insane. Just like the poor farm, The Manor housed men and women: The West side belong to the men and the East side to the women. By the 2000s there were between 20 to 40 residents, and the building cost the county $500 000 a year to maintain and operate (6). In an attempt to cut costs, the county decided to hire a not-for-profit, Community Care Inc., to provide residential elderly and mental health services. Community Care moved the residents out of The Manor and into a renovated hospital in Anamosa in October 2009, suggesting that The Manor was “dangerous … and not conducive to having disabled people live there” (7). Three men at the new Fairview center were charged with sexual assault of another resident in 2011, two serving jail time and one probation (10). In October 2013, the management team of Community Care was fired in the midst of a Medicaid fraud investigation (8), and by February 1, 2014 the new Fairview Care Center in Anamosa was closed (10). It would be fair to assume that the incidents at the new Fairview Center also occurred in The Manor. 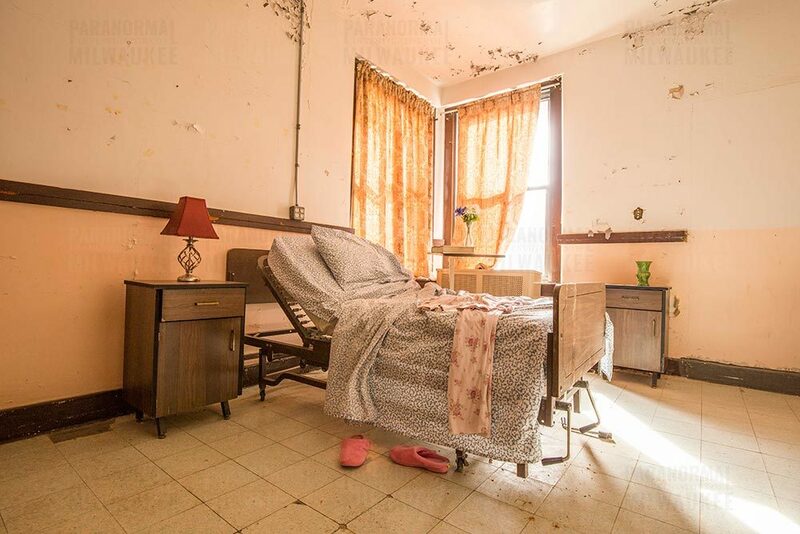 Like many asylums of the time period, they had issues with understaffing and overcrowding and utilized physical and medicinal restraints methods to manage their clients. Medical documents and personal belongings can still be found in The Manor. On September 23, 2011, Jones County sold the property for $52,050 to Q. Farm Land Trust, with plans of converting the building into a Bed and Breakfast (9). The Manor had a new roof installed in 2000 and was up to fire code, but still required substantial repair to be inhabitable. Today, the Manor sits alone at the end of a long Iowa road with the view of grassy and empty farm fields. The new owners, Cindy and her husband, bought Edinburgh Manor to preserve its history. However, they experienced numerous unexplained events at The Manor and decided to opened it up for paranormal investigations since the summer of 2012. It is said that the spirits of the dead still roam the property at night. 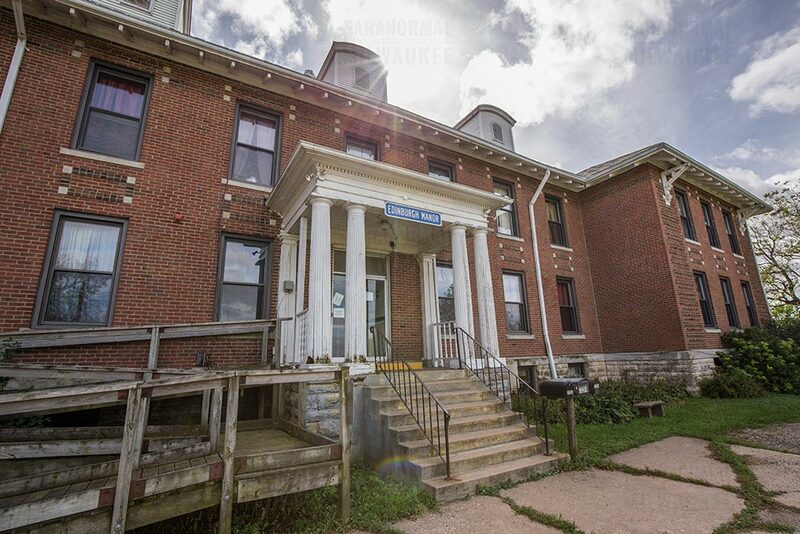 With a wide array of experiences being reported by its caretakers as well passing paranormal investigators, it is no wonder that Edinburgh Manor is considered to be one of the most haunted buildings in the Midwest, some would say the entire country. These reportedly paranormal occurrences range from the benign giggling in the dark and footsteps to malevolent shadows and full body apparitions. A spirit of a young girl is claimed to roam the 1st Floor hallway, laughing, singing and playing with the toys in Room 106. Her name is allegedly “Susie” and she was just dropped off there. 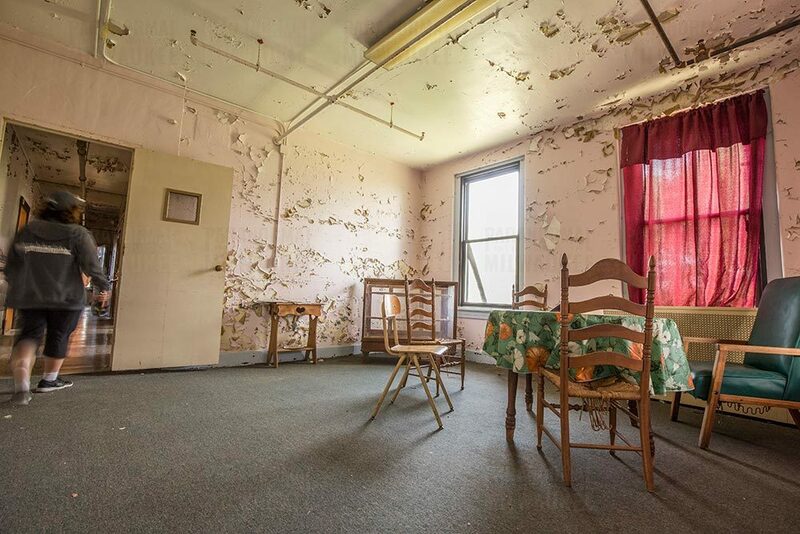 A spirit of a man is claimed to exist in Room 121 and may roam the hallway to Room 108. It is believed this man committed suicide in what is presently known as the, mop closet, by hanging himself with a sheet from the inside door knob. The current building owner claimed to see the apparition of a female figure, dressed in a white dress, on top of the stairs at the landing of the 2nd Floor. This apparition was claimed to happen between the hours of twelve noon and two in the afternoon. In this same spot, Marilsa, a PIM investigator, claimed to see a white mist near the ceiling while setting up for an investigation. Though this could have been caused by changes in the atmosphere of the building while the sun set, PIM has warranted that this requires further investigation and has opted to place a camera filming this location during all recent investigations of Edinburgh Manor. In Room 204, a toy fire truck was located on the floor. Cindy, one of the owners, advised the group that the fire truck seems to “move” throughout the building. 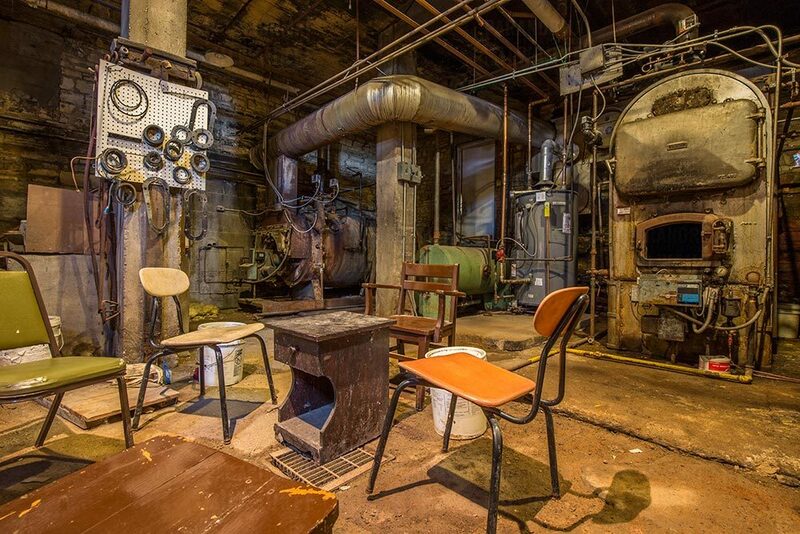 A photo of the Basement Kitchen Office, it is reported that an apparition appeared in the corner, near the table. Edinburgh Manor’s stairway doors are reported to have a tendency to open and slam shut of their own accord. The owner’s dog is also mysteriously drawn to the lower floor’s staircase. A famous spirit said to still be roaming Edinburgh Manor is named The Joker. Said to inhabit the Basement, this spirit supposedly wanders between the various rooms, but pays special attention to the Boiler Room and a small formerly padded room (still referred to by that name) on the opposite side of the basement. It is in this room that he was supposedly held and ultimately committed suicide by hanging. The Joker has been described as tall and slender with a malevolent demeanor. 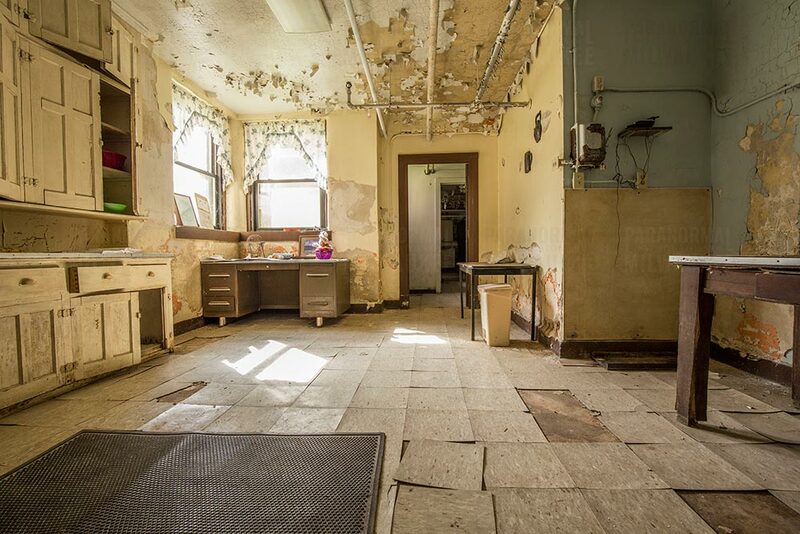 One of the claims tied to the Basement Dining Room is that The Joker tends to throw dishes to the floor. On Ghost Adventures Season 11 Episode 1, Zak Bagans claimed to be “possessed/ felt an evil presence,” while in the Padded Room. Billy Tolley supposedly had an experience in the Basement Laundry Room wherein a plate was knocked off a table and shattered, causing him to have a screaming fit. Personal claims in the basement are not at all uncommon. On a previous investigation, one of our investigators was walking into the Main Basement Hallway from the Basement Kitchen together with a second investigator when she felt the second investigator pull on her arms as if to stop her. When the investigator turned around to see why she was being stopped, she realized that our other investigator was in another room at least twenty feet from her. During a recent public investigation hosted by PIM, one of our guests claimed to experience what she described as a hand on the back of her neck which were at the same time cold and burning hot. Although she was completely fine after a minute or so, her neck was observed to have a pronounced red mark after this occurrence. Although we are unable to say that this was anything but a personal claim, it still adds to the mystery of Edinburgh Manor’s famous basement. No buyers make offer for Jones’ county home by Steve Gravelle, The Cedar Rapids Gazette, January 22, 2011. Iowa Medicaid fraud investigation leads to firings by Kristen Gelineau, AP Regional State Report – Iowa, October 19, 2013. Jones County’s old home has new owner by Steve Gravelle, The Cedar Rapids Gazette, September 23, 2011. Long-term care center will close in Anamosa by Steve Gravelle, The Cedar Rapids Gazette, December 14, 2012.